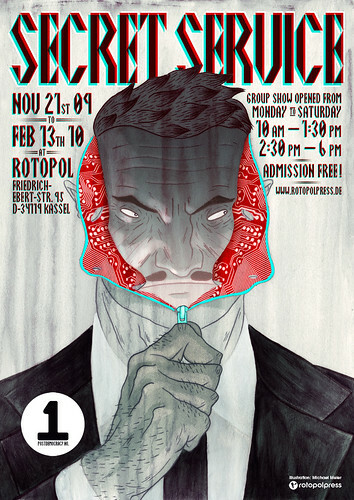 This year the topic of rotopol’s annual group show is Secret Service. This show is the first one of a series of group shows happening next year regarding the uber-topic post-democracy. So if you’re around Kassel/Hessen (home of the Hessian horseman)/Germany between November 21st 2009 and February 2010 check it out! Btw, the kickass 3D-vision-enabled poster was made by my good friend michael meier!